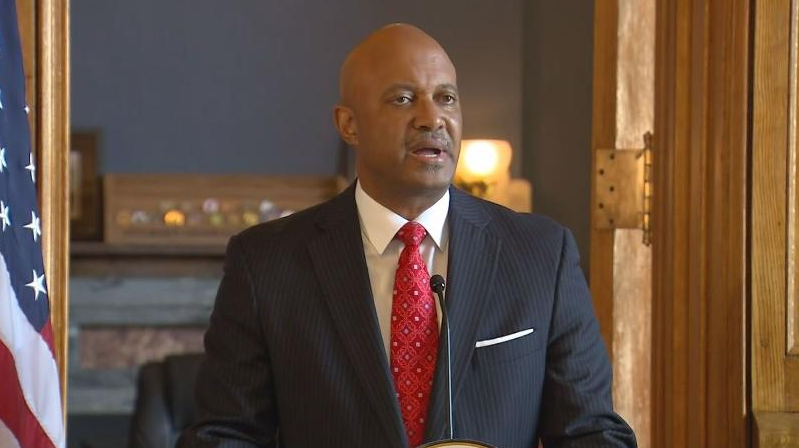 INDIANAPOLIS--Indiana Attorney General Curtis Hill will not resign. He is accused of inappropriate sexual behavior toward at least four women on the night on March 15, at an after party following the end of the legislative session. "A week ago today, I had a name. And, I want my name back," Hill said in a Monday morning news conference. Last week Gov. Eric Holcomb, and several other top Republican leaders called on Hill to resign. House Speaker Brian Bosma and Senate Pres. Pro Tem David Long both said they believe the women who accused Hill. "I stand before you a condemned man. Condemned without trial, condemned without notice. Condemned without the benefit of any basic rights that ensure fairness" said Hill, defiant in his address to the media. "Apparently in this climate the standard is guilty and who cares if you're innocent." Hill said the calls for his resignation were unwarranted and were based on what he said were inaccurate statements by one of his accusers. He also said Holcomb should not have been so quick to ask for Hill to quit. "I respect the governor and I believe him to be an honorable man. And, I wish he had reached out to me regarding these accusations, before rushing to judgement." Hill said he believes some of the calls for his resignation are based on "self preservation instinct" on the part of his fellow politicians. Hill said he believes the media and social media played a large part in the mounting calls for his resignation, which came one after the other, from Thursday night through the day Friday, and came from the likes of Holcomb, Bosma and Long, and others like Sec. of State Connie Lawson and Rep. Susan Brooks, who is like Hill, a former prosecutor. "This is America and in America we cannot overlook the presumption of innocence until proven guilty," said Hill. He said he welcomes an investigation. But, until then, he is going back to work.